No, you don't have to call it "The O.C.," and it's perfectly legal to pass through Orange County, California without visiting Disneyland. In fact, the less time spent at Disneyland, the more time you can spend playing the Orange County Golf Trail. 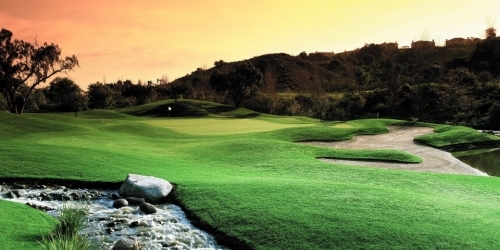 Whether playing the Monarch Beach Golf Course, a Robert Trent Jones design, the San Juan Hills Golf Course, where affordability is at the fore, or the Ted Robinson gem of Tustin Ranch Golf Club, golfers will revel in the balmy climate and year-round golf. If they add rounds at Coyote Hills or Anaheim Hills, they will be assured that throughout the Orange County Golf Trail there is not a Mickey Mouse course anywhere. The pro shop, golf school, practice facility, club house, and wedding and banquet services are the finest available of any golf course in Orange County - just as tradition would have it. 949-240-8247 Resort Robert Trent Jones, Jr.